The Metaphysical Engine, Or What Quill Did is a companion piece to Detained as both stories take place simultaneously. Here, we see what might have been: a Quill-centered episode that managed to actually be worth the time to watch. The Metaphysical Engine, however, played like something we should have had and will never get: a highlight reel of Quill: The Series. That is both a good and bad thing, as we also get a cliffhanger that seems a bit outrageous, even if in a sense it is not a stretch. Miss Quill (Katherine Kelly) is now going to do her best to get the Arn, the creature inside her head that controls her free will and binds her in service to Charlie. She has been promised this by Dorothea Ames (Pooky Quesnel), the new Headmistress at Coal Hill, working for the still unknown 'Governors'. To perform the surgery is Ballon (Chiké Okonkwo), a shapeshifter imprisoned by the Governors. They will release him if he can perform the surgery. With that, the three of them travel all over the place in a madcap race. To get to their destinations, they use a metaphysical engine. This tiny device will take them to places that theoretically do not exist, but that can exist if they are believed to exist. That is how they are able to go to the 'Arn Heaven', where they can collect one to study, to the Ballon version of Hell, to get blood from their Devil to allow him to shapeshift, and to 'Quill Heaven', where the Ballon kills their newly-born Goddess. No worries: as Dorothea explains as these places theoretically exist, the Quill Goddess can be reborn. Ballon manages to perform the surgery and the Arn is out of her head. There is a large scar across her face, but that's a small price to pay for Quill's freedom. Soldier to soldier, they make love. It's now that they discover they are not at Coal Hill as they thought. Instead, they are actually inside the Cabinet of Souls, where Dorothea has one last trick up her sleeve. There is enough energy to transport one of them, so they must fight to the death. Did writer Patrick Ness just watch Spartacus when he wrote this? Just a thought. Obviously, we know who will win, and Quill returns to Coal Hill, where she saves Charlie's life but whom now mocks the Prince with the fact that she has her free will back...and there are going to be some changes. One of them is her, as Quill is now pregnant. It just seems such a tragedy that with one episode to go, we wasted so much time on the kids when Class should have focused around Katherine Kelly and her character, Miss Quill. She was a fascinating character: in turns sarcastic and blunt but also one driven by revenge and a desire to be free. She endured the slings and arrows of Matteusz's bottom, and she did it with a mix of quips and action. In other episodes, she showed that despite being the warrior queen, Quill was also one with deep emotions that she couldn't or wouldn't accept. The hurt of seeing her people destroyed, the long-suffering of being forced to care for someone she loathed (and have it lorded over her): Quill was an all-around fantastic creation. The Metaphysical Engine allows Kelly a full range of emotion. She's still the sarcastic, even brutally honest creature she's always been, but she is also a woman who has found love. I think that having her and Ballon become lovers is a wild stretch, but she did need some release. Kelly is simply pitch-perfect as Quill. From the opening quips (when asked by Dorothea, 'Is that what you're wearing? ', Quill doesn't miss a beat by replying, 'Is that what you are?') to her moments of rage ("Where are we? Who is this Little Lord Growls-A-Lot and why are we all so bothered that he killed a kitten?" she screams when they are unbeknownst to her in 'Arn Heaven') to her acceptance of things ("What good is a soldier without a scar?" she replies when told of her facial post-surgery look). There isn't a single moment when I did not care about Quill or her Wild Ride. One last quip: when Quill thinks she's returned to Coal Hill, she calls it "my own personal Hell". Quensel brought a curious bit of humor as Dorothea, a bit of a bumbler who is still trying out the Metaphysical Engine (she explains she's been through various simulations, but that this is the first time actually operating it). In her Indiana Jones-like ensemble, Quensel makes Dorothea amusing, even endearing. Okonkwo gets slightly short-shifted as Ballon, the surgeon/love interest, but he also manages his moments well, particularly the more touching ones. As Quill snaps that she does not want pity, he tells her "I do not offer you pity. I offer you a shared sorrow." Pity we knew he wasn't going to make it out of The Cabinet of Souls. The idea of the metaphysical engine itself is a brilliant one, and Ness should be congratulated for coming up with something that allows for an ethereal world to be made concrete. The Metaphysical Engine should rate higher. It is certainly the best Class episode, and unless The Lost ends up being a masterpiece I doubt any will be better than The Metaphysical Engine. The episode gets points knocked down, however, because a lot of it has to be rushed and chaotic because Class is attempting to squeeze in so much in such a brief running time. Essentially, The Metaphysical Engine is trying to fit in a whole season/series worth of story into one episode, making things zip by so quickly we can't get a full baring on things. I think it would have been interesting if Class had spread this story out over several episodes, having brief moments where Quill, Ballon and Dorothea travel to each location for her ultimate aim. It would have allowed for the Quill/Ballon relationship to grow over time. It would have given us a mystery: would Quill manage to break free from Bonnie Prince Charlie? It would also have allowed viewers a chance to be ahead of the characters and know that Quill had a secret agenda. I also think that the actual surgery is rather graphic both for the target audience and in general. I was surprised at the gruesome nature of having her eye essentially removed, and think they should have pulled back and/or reedited the sequence. The Metaphysical Engine does end on a pretty outlandish note when we see Quill is pregnant. OK, so time inside the Cabinet of Souls runs differently than on Earth or another world, but this seems a bit of a stretch and there just to provide a shocking conclusion. Still, The Metaphysical Engine is the best Class episode. 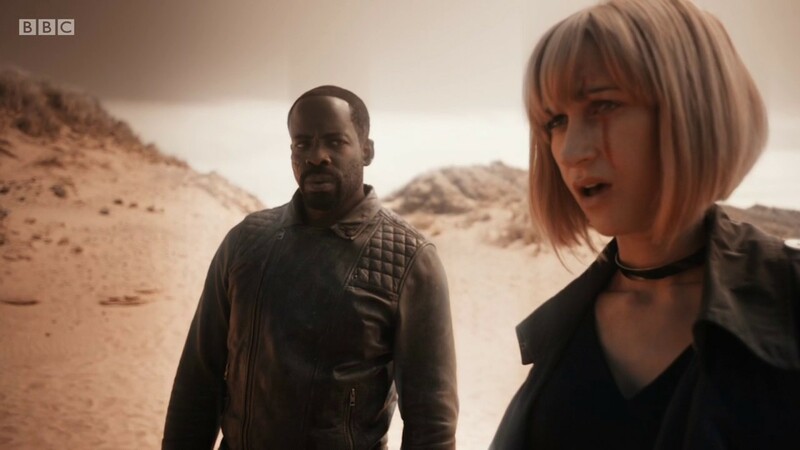 It reinforces my view that the series should have been centered around Katherine Kelly and her Miss Quill, and if this had been a highlight reel versus just a mere episode, it still would have been better than almost all of Class (or Doctor Who for that matter).